Seven ninths of Bobbi Woods’ exhibition ‘COMA (so fine)’ is, ostensibly, exactly the same. She has sprayed identical movie posters with black enamel, masking out only the title, Coma, which stands out in dull, lithographed black against the oily gloss of Woods’ paint. Except, of course, they are all different. For a start, they are titled individually: COMA (repeating not repeating), COMA (deep space, Palm trees), COMA (INSERT CLOSE UP) are amongst the variations (all works 2011). The original posters – probably for ease of distribution – were folded into eighths. On each, the sections fall in slightly different places and, over the unpainted letters of their title, the creases break into fuzzy paper fibres like little lines of cocaine. Woods stipulates that when the works are stored, they are folded in the same pattern, resulting in the ridges and valleys being rescored with each exhibition, and in the glossy paintjob getting increasingly scuffed as it rubs against itself. These aren’t images, implies Woods, but objects. No trace of the original poster design is left after Woods’ obliterating work with the spray can, but as she well knows, it’s not hard to Google the name of the film. (Perhaps our desire to do so is the successful function of what the press release describes as ‘a framework for seduction’ created by ‘the gesture of withholding’.) For the record, ‘Coma’ was a 1978 thriller directed by Michael Crichton in which hospital patients’ organs are harvested and sold while they’re unconscious. Woods’ retentive surfaces hide a lurid paranoia over the breach of the human body. Things don’t stay literal for long, though. 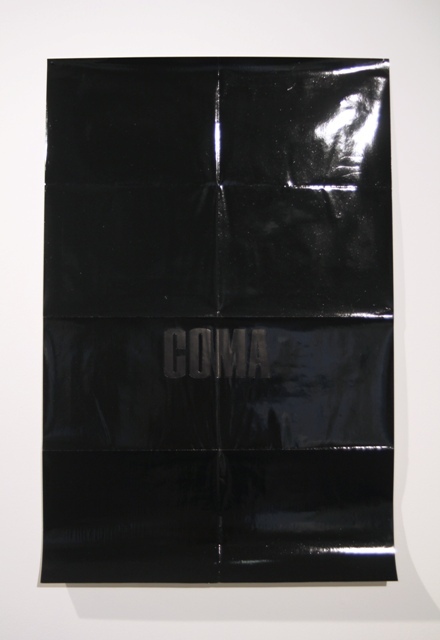 ‘Coma’ comes to refer more to the paintings’ formal qualities than to a medical condition. As with the work of Ed Ruscha, to whom Woods owes much, words float free of their intended purposes. So Fine is another folded poster, this time painted in midnight blue. The title text – again, masked against the paint – appears in blobby yellow script. It feels resigned, a throwaway aside, but actually the words are the title of a bawdy comedy from 1981 about bottomless jeans for women. A video, Noir: California Light (Some Like it Hot), is not playing in the gallery but DVDs are available for visitors to take home. Like its slipcase, the six-minute work is entirely black, punctuated only by Woods’ white text. The dull screen test of my reflected face was granted generous atmospherics by Woods’ subtitles and composer Brooke Eberle’s soundtrack. If there’s a political critique buried in Woods’ elegant work, then it is surely to do with the superficiality of the Hollywood image machine and the morbid fears and desires that undergird it. But, like the subjects of that critique, these nonchalantly curling sheets of paper seem more concerned with looking cool than troubling anyone with heated argument. The ambition to be seductive first and political second may be Hollywood’s most insidious influence on Los Angeles’ art. Woods’ work may well be part of the problem rather than the start of a solution.